Britain could suffer a Donald Trump-style Government shut-down under a Remainer plot to block a no deal Brexit. Remainer Tories are joining with Labour and Lib Dem MPs to back changes to a key piece of legislation to bind the Government’s hands if Theresa May refuses to take no deal off the table. Labour ex minister Yvette Cooper and Tory MPs Oliver Letwin and Nicky Morgan have tabled an amendment to the Finance Bill. It would rob the Treasury of its no-deal powers if ministers pressed ahead with a plan to crash out of Brussels without the support of MPs. A second amendment, tabled by Lib Dem leader Sir Vince Cable and the Greens, would stop the Treasury from raising income or corporation tax unless parliament approved a Brexit deal. The twin changes to the Finance Bill, which is being voted on by MPs on Tuesday, could throw the Government into chaos if they are passed. And it risks plunging Britain into a partial government shutdown similar to what is happening in America, where Mr Trump has refused to fully fund the Government until he gets money for his border wall with Mexico. It comes as Mrs May today launched a fresh Brexit PR blitz as she desperately tries to convince MPs to back her Brexit plan. 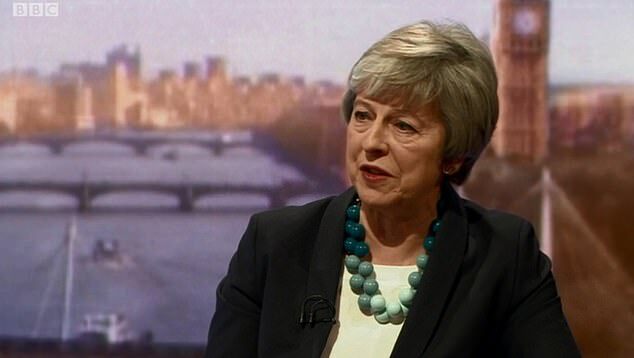 Appearing on the BBC’s Andrew Marr Show, she warned the UK would enter ‘uncharted territory’ if they reject her deal in the crunch vote later this month. And she insisted that her blueprint is a ‘good deal’ which delivers Brexit while safeguarding the economy and jobs. Theresa May today denied reports that she is set to delay the crunch Brexit vote again as MPs remain deadlocked over the deal. But the Prime Minister refused four times to rule out bringing her deal back to be voted on repeatedly if it is rejected by MPs first time. She warned that Britain would be in ‘uncharted territory’ if MPs reject her plan and insisted that it is a ‘good deal’ which protects jobs and the economy. And she also refused to rule out holding a second Brexit referendum if MPs voted to back one – although she said she opposes one. Mrs May is braced for a fresh battle on her Brexit deal as Remainers and Eurpsceptics return from their festive break determined to torpedo it. Tory Brexiteers today warned Mrs May that their opinions have hardened over the Christmas break and that 100 Tory MPs are still dead set against it. Meanwhile, No10 are launching a charm offensive to try to pick off opponents – inviting all Tory MPs for drinks receptions this week to woo thm. Kicking off her latest Brexit PR blitz with an interview on the BBC’s Andrew Marr Show, Mrs May insisted that most Britons want politicians to stop squabbling and back her deal. But the PM also refused to say how long she plans to stay on as Tory leader after promising her warring MPs that she would quit before the next election. But with just over a week to go to the crunch Commons vote on the Brexit deal, she is still facing a wall of opposition from Remainers and Eurosceptics on her own backbenches. The first clash is set to erupt on Tuesday when MPs will debate amendments which threaten to force a partial shutdown of the Government if the PM pushes ahead with a no deal Brexit. Ms Cooper has tabled an amendment to the Finance Bill, which gives the Treasury the right to spend money on no-deal Brexit planning. The amendment sets a precedent that would mean Britain would only be able to deliever a no deal Brexit if MPs explicitly approved it – rather than Britain crashing out with no deal by accident. 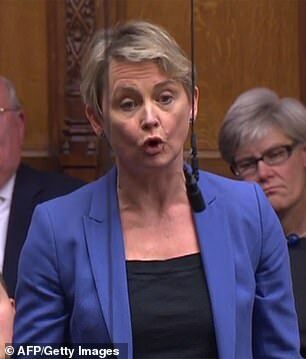 Ms Cooper, head of the influential Home Affairs Select Committee, said: ‘The risks to our economy and security from ‘no deal’ are far too high and it would be irresponsible to allow it to happen. ‘I do not believe Parliament would support ‘no deal’ and Ministers should rule it out now. Time is running out and this is too serious for brinkmanship. ‘Parliament needs to make sure there are opportunities to stop the country reaching the cliff edge by accident. This amendment helps to do just that’. 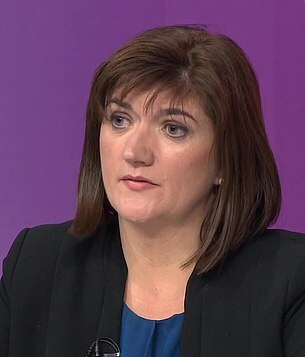 Ms Morgan said: ‘Many of us have been clear that Parliament will not allow a ‘no deal’ situation to unfold, and with less than 12 weeks to go until 29 March it is time for Parliament to show our opposition to a ‘no deal’ exit’. The plan is also backed by select committee leaders and Labour MPs Hilary Benn, Rachel Reeves and Harriet Harman, Tory MP and committee chairwoman Sarah Wollaston, and Frank Field. A second amendment, tabled by Sir Vince would stop the Treasury from raising any income tax or corporation tax unless parliament approved a Brexit deal. The showdown looms as MPs return to Parliament from their Christmas break tomorrow. Number Ten had hoped the festive break would clam down her mutinous backbenchers who may return more willing to compromise. Burt Brexit rebel ringleaders today warned the PM that they have returned from the holiday more determined than ever to torpedo her deal. Mrs May survived a bid to oust her as Tory leader and PM at the end of last year, but she still faces a massive wave of opposition to her Brexit deal across Parliament. 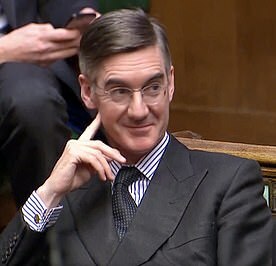 Jacob Rees-Mogg today warned that Brexiteer MPs have ‘not gone soft over Christmas’ and are preparing to vote down her Brexit deal. The Brexiteer rebel ringleader said that he expected more than 100 Tories to revolt against the Withdrawal Agreement when it comes to the crunch Commons vote this month. Jacob Rees-Mogg has warned Theresa May that Brexiteer MPs have ‘not gone soft over Christmas’ and are preparing to vote down her Brexit deal. It comes amid reports that Tory activists have effectively gone on strike – refusing to campaign or raise party funds – amid fury at the PM’s Brexit deal. Theresa May had hoped that her mutinous MPs would calm down over the festive season and return to Parliament ready to compromise on Brexit. Number Ten is laying on drinks parties for every Tory MP as they return from their Christmas holidays this week in a fresh Brexit charm offensive. But Mr Rees-Mogg – who led the failed bid to oust Mrs May as Tory leader late last year – insisted that Tory Brexiteers are in no mood to back down. And Tory MP and fellow leading Brexiteer Peter Bone echoed the warning. The Tory MP, who once called Mrs May the ‘queen of Brexit’, said MPs will not be returning from the Christmas break ready to back her deal. He told Sky News’ Sophy Ridge On Sunday that the time off will not have changed any minds, and if anything it will have ‘hardened attitudes of MPs to what is called a no-deal Brexit’. Despite the onslaught, Mrs May faced the cameras today to launch afresh Brexit PR blitz as shed desperately tries to win support for her deal. Appearing on the BBC’s Andrew Marr Show, she denied reports that she is set to delay the crunch Brexit vote again as MPs remain deadlocked over the deal. Mrs May said that she is planning a three-pronged attack to win over her mutinous MPs – to give greater reassurances on the hated Irish backstop, give a greater role to Parliament as the UK enters the second stage of Brexit talks, and to win more concessions out of the EU. But she admitted that ‘we are still working’ on getting any fresh assurances out of Brussels. But Mrs May also refused to say how long she plans to stay on as Tory leader after promising her warring MPs that she would quit before the next election.